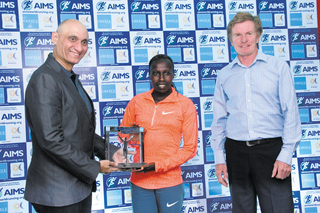 Florence Kiplagat (KEN) received the AIMS World Record Award in New Delhi (IND) on 27 November for her world record breaking run of 1:05:09 in the eDreams Mitja Marató de Barcelona on 15 February 2015. Florence’s achievement was recognised by AIMS during a presentation prior to the Airtel Delhi Half Marathon made by AIMS General Secretary Hugh Jones and Vivek Singh, Joint Managing Director of Procam International, the promoters of the Airtel Delhi Half Marathon. Kiplagat (28) broke her own world record that she had set at the same race one year earlier by 3 seconds. She received the AIMS World Record Award for the first time in October 2014. The 100 km del Sahara planned for March 2016 in Argentina has been cancelled. The Vadodara Half Marathon (IND) will take place on 7 February 2016, not 13 December 2015 as previously published. The Mauritius Marathon (MRI) will take place on 24 July 2016, not 17 July as previously published. The Petra Desert Marathon (JOR) will take place on 3 September 2016, not 4 September as previously published. The Runatolia Marathon (Half + 10km) (TUR) will take place on 6 March 2016, not 13 March as previously published. It’s been a highly successful last 12 months or so for Eliud Kipchoge with victory in three marathon classics of Chicago, London and Berlin. And 2015 became even better for the Kenyan without running a single step when he was awarded the men’s prize as Marathon Runner of the Year at the AIMS Gala in Athens on 6 November. Ethiopia’s Mare Dibaba was awarded the women’s prize after a year in which she won the world title in Beijing among an equally impressive list of accomplishments. This was the third annual edition of the Best Marathon Runner of the Year Awards, organised by The Association of International Marathons and Distance Races (AIMS), held as ever in Athens around the time of the Athens Marathon the Authentic. 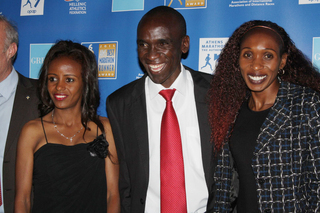 The AIMS membership of more than 380 organisers of running events voted Kipchoge and Dibaba the winners. The period under consideration for the voting was from the beginning of October 2014 to the end of September this year. Since the start of the judging process, Eliud Kipchoge has clearly established himself as the best marathon runner in the world. He turned 31 the day before the AIMS Gala and could look back on a tremendous year, winning such perennially high quality races as Chicago, London and Berlin. In every one he achieved world class times as well, breaking the 2:05 barrier as a matter of course. The summit in terms of time came six weeks ago in Berlin, where he ran his personal best of 2:04:00 which remains the fastest time in the world this year. “This is a really important day for me which will remain in my mind forever. This is the first time I’ve received such an award in my career,” reflected Eliud Kipchoge and added: “I should like to thank everyone who has helped me in the past 15 years – my coach Patrick Sang but also plenty of others.” He made no secret about his next goal: “Next year I want to win the gold medal in the marathon at the Olympic Games in Rio. Olympic gold is one medal I don’t have.” If he achieves that objective, the one after could well be the marathon world record, currently held by his compatriot Dennis Kimetto, of 2:02:57. “I hope that one day I will also be the world record holder,” said Kipchoge. Mare Dibaba achieved the greatest moment in her career so far when the 26-year-old won the world title in Beijing in August. She and Kenya’s Helah Kiprop produced one of the most exciting home straight finishes in marathon championship history with the gold going to the Ethiopian by just one second. She also has enjoyed an impressive run of success in the marathon since 2014, becoming the Chicago champion and then ran the world class time of 2:19:52 for victory in Xiamen in China in January, the second fastest women’s time this year. There was more to come as she finished a narrow second in the Boston Marathon in April. “I’m very happy to receive this award, thank you very much,” said Mare Dibaba as she accepted her prize at the Gala, which was broadcast for one and a half hours live on national television and organised jointly by AIMS and the Greek Athletics Federation, SEGAS. “For the past year it has been our goal that the Gala should go ahead, despite the severe economic conditions,” said Kostas Panagopoulos, the SEGAS president. Three further awards were presented by AIMS. The Green award for an event with the best environmental policy went to the Houston Marathon and the Lala Marathon in Mexico received the award for the best programme of social responsibility. The 1972 Olympic Marathon champion, Frank Shorter, received the lifetime achievement award. The American is recovering from surgery in the USA and his son Alex, also a marathon runner, collected the award on his behalf. Paul Tergat burst through the Brandenburg Gate, but that wasn’t the barrier he was aiming to break. Fourteen years later, history had moved on down the road. The first sub-2:05 marathon ever run lay 400m ahead of him, if he could only keep going … and stay ahead of his friend and training partner Sammy Korir. He did it, and Korir came in, hard on his heels over the last 200m, only a second later. Third across the line was Titus Munji, who had kept pace with his two compatriots until 36km. It had all been in the plan, which was for Tergat to be paced as far as possible into this deliberate world record attempt. The main unknown was how far that may have been. It was a bold gambit. Although Tergat had all possible credentials – as five-time World Cross champion, former 10,000m world record holder and fastest ever over the half marathon – he had not won a marathon in five attempts. But he had run the third fastest marathon ever, over a course in London that was very clearly less swift than that Berlin could offer. And Berlin had fine-tuned their offering. The course had been changed primarily to allow the iconic Brandenburg Gate to be the backdrop to both start and finish. This incidentally changed the profile from an overall 1m drop to an overall 1m climb along the 42,195m of well-surfaced streets that separate the start from the finish (although they are also separated by only 850m of straight road). The changes had also shifted the course’s single modest climb to 8km earlier in the course, culminating at 27km. Being earlier, the climb would be less of a break point, and the denouement could be deferred until much closer to the finish line. Only 6km into the course the group had been reduced to eight, of whom four were pacemakers. It stayed the same through to 15km, the four contenders being last year’s winner Raymond Kipkoech, Tergat, and two Japanese. But there were other undeclared contenders among the accompanying pacemakers. The second group was already a minute adrift. Between them, they raised their game. Only 2km later they were on record pace by a few seconds, as they sped up along the Kufurstendamm, which was the finish straight for the old course. But there remained one more loop to run – out towards the Alexanderplatz, and then back along Unter den Linden. The pacemakers had long ceased to be anonymous helpers and were now identified contenders – but at 36km along Potsdamerstrasse Titus Munji dropped back to leave only Korir accompanying Tergat towards a new world record – but whose would it be? It was only decided – and then not conclusively – with a kilometre to run. Somehow Tergat imperceptibly edged into a 10m lead. Nothing seemed to change in terms of effort, but it was now up to Korir to claw back that space as they raced towards what was clearly going to be a sub-2:05 clocking. He couldn’t quite manage it. 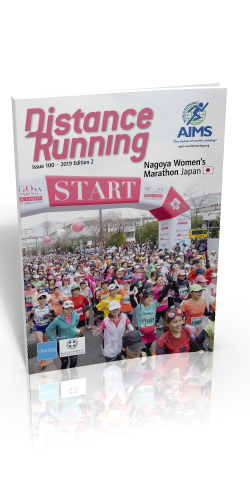 The women’s race was submerged by the men’s performances, but longtime leader Alina Ivanova finally yielded to Yasuko Hashimoto after 35km – and then faded badly. Hashimoto cracked her personal best by three minutes, and many ordinary Berliners seemed to do something similar, judging from the expressions of pleasure as they checked their watches while crossing the finish line. The 9th AIMS Marathon Symposium held in Athens addressed the subject of “Doping threats in Distance Running”. The first speaker at the Symposium was to be Kyle Barber, Medical & Anti-Doping Intelligence Officer at the IAAF, who submitted his apologies. The keynote speaker at the Symposium was Prof. Yannis Pitsiladis (MMedSci., PhD, FACSM) from the University of Brighton, speaking on the topic of “A Holistic Anti-doping Approach for a Fairer Future for World-class Sport: The SUB2 Marathon Project”. Professor Pitsiladis commented “frequently the research behind detection is insufficient. The sport needs to have serious investment in research into doping assessment rather than token efforts.” Prof. Pitsiladis highlighted research he had carried out into the form of blood doping with ‘EPO’, a project that compared athletes in test situations using EPO in trials in Glasgow, Scotland and compared athletes in the same test circumstances training at altitude in Kenya, Africa. The results showed significant increase in performance by all athletes in both locations when using EPO and also showed the challenge of detecting it as traces disappeared within 48 hours. When asked about the temptation to dope Prof. Pitsiladis talked about many athletes see it as a way of escaping poverty. Prof. Pitsiladis has a project to help the first runner to run a doping free sub-two hour marathon, the majority at the conference felt it was not a question of ‘if’ but ‘when’. The second half of the Marathon Symposium saw presentations on the theme of “Race Organisers, Coaches & Athletes Battle against Doping”. “A Runner’s View” was given by former London Marathon winner and General Secretary of AIMS Hugh Jones. Following Hugh was Mark Milde, Race Director of the BMW Berlin Marathon who spoke on the topic of “Preventive Action Plans Towards Doping Threats”. The Gammon China Coast Marathon (HKG) will take place on 31 Jan 2016, not 17 Jan as previously published. The Baxters Loch Ness Marathon (GBR) will take place on 25 September 2016, not 2 October 2016 as previously published. The Scottish Half Marathon (GBR) will take place on 18 September 2016, not 17 September as previously published. Athens, the birthplace of the Marathon, will be the focus of attention for the international running scene for three days from November 6 to 8. Firstly the Association of International Marathons and Distance Races (AIMS) will honour the best marathon runners of the year with the 2015 AIMS Best Marathon Runner (BMR) Awards, at an international Gala to be held in the evening of Friday, November 6. The next day will be marked by the Opening Ceremony for the “Athens Marathon. The Authentic”. This is followed by the high point of the Athens Marathon itself, on Sunday, where the organisers expect more than 16,000 runners to participate. This is the 3rd edition of the AIMS BMR Gala in Athens to honour the best runners of the year. The candidates were recently announced by AIMS and are the Kenyans Eliud Kipchoge and Gladys Cherono, the Ethiopian Mare Dibaba and Ghirmay Ghebreslassie from Eritrea. The winners in the male and female categories will be determined by a voting process currently taking place amongst more than 380 member races of AIMS. Winners will be announced during the BMR Gala. The period under consideration for the 2015 AIMS Best Marathon Runner Award is from the beginning of October 2014 to the end of September 2015. During this time Eliud Kipchoge won three major marathons: Chicago, London and Berlin and a few weeks ago set the world’s fastest time of 2:04:00 at the latter event. Ghirmay Ghebreslassie overturned expectations by winning the World Championship race in Beijing in August. His gold medal was achieved after finishing sixth in Chicago and second in Hamburg in his previous races. Gladys Cherono ran her debut marathon in January when she missed victory in Dubai in January by just one second, finishing in the highly impressive time of 2:20:03. She went one place better in her second attempt at the distance, running the fastest woman’s time this year of 2:19:25 to win the Berlin title at the end of September. This was also the fastest performance by a woman on an officially recognised course since April 2012. Mare Dibaba is the only other woman to have broken 2:20 this year. She achieved that feat with 2:19:52 to win the Xiamen Marathon in China in January. She won the women’s marathon at the World Championships in Beijing and her career includes victory in the 2014 Chicago Marathon and second place in Boston this April. Four more special awards will be presented during the Gala, which is organised by AIMS and the Hellenic Athletics Federation (SEGAS): the Green Award, the Lifetime Achievement, the Social Award and the Popular Runner Special Award. It has already been announced that the Chevron Houston Marathon will receive the Green Award. 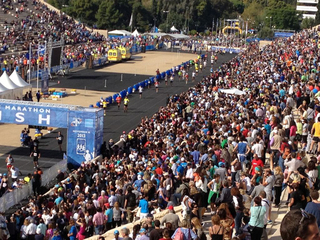 Saturday, November 7, will mark the traditional Opening Ceremony for the “Athens Marathon. The Authentic”. The Ceremony takes place inside the Archeological Site of the historic Marathon Tomb, the memorial site of the Battle of Marathon, where the Greek troops defeated the Persians in 490 BCE. The Athenian soldier-messenger-runner, who according to legend ran from the battlefield to bring news of victory to his fellow Athenians, was later the inspiration for the creation of the marathon race for the inaugural Olympic Games of the modern era in Athens in 1896. During the Ceremony, the Marathon Flame, established in 2007, will be lit in front local authorities, IAAF, AIMS and SEGAS executives, marathon legends and race directors of more than 70 international marathon events. The Marathon Flame is carried by relay to the start of the race in the nearby town of Marathon and marathon runners of next day’s event have the chance to take memories of it. In these difficult economic times the “Athens Marathon. The Authentic” has become a real Greek success story. The organisers SEGAS have again recorded increased numbers of entrants for the race with approx. 16,000 expected to run on the original marathon route, an officially measured course, served by an organization of very high international standards. Including races over shorter distances (5 and 10 km as well as races for children), some 43,000 entries for the event on Sunday, November 8 have been received. The classic race over 42.195 km will begin in the town of Marathon as ever. The historic course will take participants into Athens and the Olympic Arena for the 1896 Games, the Panathinaikon Stadium. Entries for the Marathon are still available and can be accessed by going to: www.athensauthenticmarathon.gr. The Standard Chartered KL Marathon (MAS) has been cancelled due to an urban haze which reached unhealthy levels. The medical team, the Malaysian Athletics Federation (MAF), and the Institut Sukan Negara advised cancellation because the rapidly deteriorating air quality presented a danger to the health of participants. This decision was supported by co-organisers, Dewan Bandaraya Kuala Lumpur, and the title sponsor, Standard Chartered Bank Malaysia. Registered participants can collect finisher entitlements by arrangement. A Kenyan double in a major marathon is hardly unusual but there was a majestic quality about the manner of victory for both Eliud Kipchoge and Gladys Cherono on the streets of Berlin in the 42nd edition of the BMW BERLIN-MARATHON. The 30-year-old Kipchoge defied footwear problems to run a 2:04:00 personal best by five seconds in ideal weather conditions. He achieved this while both his insoles were flapping about, half out of his shoes, from kilometre 16, although the runner himself admitted he had been aware of a problem within the first kilometre. His fellow Kenyan Eliud Kiptanui achieved a big lifetime best for second place with 2:05:22 ahead of the Ethiopian Feyisa Lelisa, who clocked 2:06:57. Gladys Cherono smashed the 2:20 barrier in only her second marathon, joining the exclusive club of now 18 women who have achieved this distinction. The Kenyan ran the fastest woman’s time of the year with 2:19:25 ahead of the Ethiopian duo of the former Berlin winner Aberu Kebede (2:20:48) and Meseret Hailu (2:24:33). Taking into account both winning times, this edition of the BMW BERLIN-MARATHON achieved seventh place in the all-time marathon list for quality of performance. A grand total of 41,224 runners had registered for the race. A leading group of six was soon formed with the Kenyans Emmanuel Mutai, Eliud Kipchoge, Geoffrey Mutai and Eliud Kiptanui prominent along with the Ethiopians Feyisa Lelisa and Tamirat Tola. As the pacemakers went about their work in the early stages, the main talking point was the state of Eliud Kipchoge’s shoes: the bright yellow footwear had acquired a distinctive and unwanted accessory: both insoles had worked their way out of the shoes and were flapping around his ankles with every step. “It wasn’t a good day for me in these shoes, although they’re actually very good. I tested them in Kenya but just had bad luck on the day. I had problems from the first kilometre,” explained Eliud Kipchoge, who may well have threatened the world and course record of Dennis Kimetto from last year but for this. Last year Kimetto became the first man to break 2:03 when he won the Berlin title in 2:02:57. An attack on the world record began to look out of reach when the lead group went through halfway in 61:53 since the plan had been for a split of 61:30. Despite his handicap, Eliud Kipchoge pushed the pace after David Kogei, the last pacemaker, dropped out at 29 km. Kipchoge’s surge split the leading group and set up the decisive move when he ran 2:48 for the 32nd kilometre. That took him well clear of his training partner Emmanuel Mutai. The latter was then overtaken by Eliud Kiptanui and Feyisa Lelisa and finished fourth in 2:07:46. “My goal was the world record but it wasn’t to be today. Nevertheless I’m delighted with this win and a personal best. I would love to return to Berlin and improve my time,” said Eliud Kipchoge, who finished second in the BMW BERLIN-MARATHON two years ago in what remained his personal best of 2:04:05 until today. The improvement of five seconds took him to ninth on the all-time rankings for the fastest marathons. Gladys Cherono was always to the fore among a quartet who formed the women’s leading group. In January this year the Kenyan ran a highly impressive marathon debut of 2:20:03 in Dubai while she had alongside her the Ethiopians Aberu Kebede, twice a winner of the BMW BERLIN-MARATHON title (2010 and 2012) as well as Meseret Hailu and Tadelech Bekele. The race had become a duel before 20 km as Cherono and Kebede drew clear. After a halfway split of 70:15, Cherono increased the pace with 10 km to run and broke away from her Ethiopian rival. That injection of pace also helped her go under 2:20. 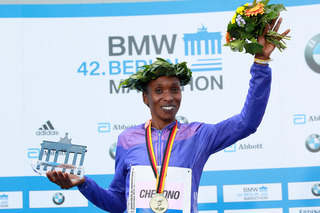 Gladys Cherono ran through the Brandenburg Gate and across the finish line in 2:19:25, the third fastest time ever run by a woman in Berlin and just 13 seconds slower than the course record set by Japan’s Mizuki Noguchi ten years ago. "I didn’t expect to run so fast and am delighted to win and the way I did it,” said the Kenyan, who achieved the fastest women’s marathon time since April 2012. 41,224 runners including a world-class elite field will tackle the distance of 42.195 km in Germany’s biggest marathon on Sunday 27th September. Kenya’s Eliud Kipchoge, arguably the most successful marathon runner of the past twelve months, will join forces with two compatriots who occupy second and third spot in the all-time marathon rankings. In his last two triumphs over the classic distance – Chicago (2014) and London (2015) – Kipchoge already managed to beat elite fields of the highest quality. The former 5,000m world champion will now attempt to improve his personal best of 2:04:05 which he set here in Berlin in 2013, when he was beaten into second place by Wilson Kipsang, who himself ran a world record (2:03:23) that day. Kipchoge will certainly attempt to complete his hat-trick of wins even though he is up against extremely strong competition again: Emmanuel Mutai (Kenya) is the third fastest marathon runner of all time, since finishing relatively close behind winner Dennis Kimetto when he set the current world record of 2:02:57 in last year’s BMW Berlin Marathon. Mutai, who played a large part in maintaining the pace that made the record possible, crossed the line in 2:03:13. The third member of the formidable trio is his namesake Geoffrey Mutai (no relation) whose 2:03:02 in the 2011 Boston Marathon (course not eligible for records) was the fastest ever run over the distance at the time. 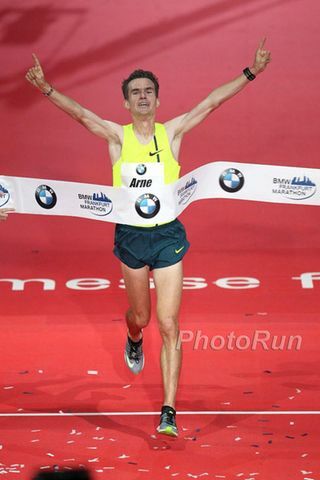 He went on to win New York later that year and followed this up by winning the BMW Berlin Marathon in 2012. All three of them have experience on the Berlin course, which is regarded as the fastest in the world. They will be there on the start line for exactly this reason – to improve their personal bests. How the story ends will be determined this weekend and will be partly dependent on weather conditions on the day. In the women’s race Aberu Kebede from Ethiopia leads the field. She won here in 2010 and 2012, and in the first of the two victories she set her personal best of 2:20:30, which remains her fastest time. Her strongest opponent is Kenya’s Gladys Cherono who is the reigning half marathon world champion (2014), the African champion over 5000m and 10000m (2012) and winner of the world championship silver medal in the 10000m in Moscow (2013). At the start of this year she competed over the marathon distance for the first time and managed an outstanding performance of 2:20:03, showing great promise. The third main candidate for the title is Ethiopian Meseret Hailu, whose personal best is only slightly slower at 2:21:09 – set in her 2012 win in Amsterdam, the same year she was crowned half marathon world champion. Arne Gabius has decided that the second marathon of his career will mark a return to Frankfurt, the city where the 34-year-old made such a scintillating debut at the distance a year ago. He will return to the distance classic beside the River Main for this year’s race on October 25. His debut the previous year was impressive indeed with 2:09:32 and now he has set his sights even higher, taking aim at the German marathon record of 2:08:47, set in 1988. He can expect a tough challenge from his African rivals in Frankfurt, including Alfers Lagat of Kenya, who has a best of 2:07:11 and Ethiopia’s Getachew Terfa (2:07:32). The Frankfurt Marathon and its Berlin counterpart are the only German events with the accolade of the IAAF Gold Label, the highest category of road racing awarded by the world governing body. Last year Arne Gabius thrilled fans along the course and the worldwide television audience with the quality of his debut marathon. His time of 2:09:32 was the fastest by a German for 24 years and placed him fourth among the national all-time list. In a world-class field he finished in a highly creditable ninth place. “I’ve great memories of the Frankfurt Marathon, I can still picture the scenes in my mind. Frankfurt has a fast course and the timing of the race in the season suits me perfectly, everything came together last year in Frankfurt,” explained Gabius, who lives in Stuttgart, about his decision to return to the Frankfurt Marathon. An additional incentive for the leading German runners is that Frankfurt includes the National Marathon Championships this year. “It’s great that the German Championships are finally being given the kind of high profile in Germany which only marathons in Frankfurt, Berlin and Hamburg can offer at present. I’m delighted that this means I’ll also have the chance to become German champion,” said Arne Gabius, who will be attacking the German record of Jörg Peter when the runner from Dresden achieved 2:08:47 in Tokyo in 1988. “My aim in Frankfurt is to run 46 seconds faster than my debut. I’ve spoken with many top runners and they say the second marathon should be a considerable improvement on the first,” explained Gabius. Jo Schindler regards the decision of Arne Gabius to return to Frankfurt as “Confirmation of our work and that Arne really wants to repeat what he experienced with us in 2014.” Gabius was in demand with other autumn marathons both in Germany and abroad. “But it’s only on Frankfurt’s fast course that he has the chance to become German champion and achieve a strong finishing position in an IAAF Gold Label Race,” said Schindler. Arne Gabius has no doubt he’s made the right choice: “I’ll be going to Frankfurt with a good feeling because everything went well last year. I was very impressed by the smooth operation of the organising team and everything about the race.” In the immediate future the track is his priority, since he will be competing in the 10,000m in the World Championships in Beijing this Saturday. Additions to the already strong elite field are expected. At present the leading African contenders are Alfers Lagat of Kenya, whose personal best of 2:07:11 was set when finishing third in Eindhoven last year. Another sub 2:08 performer is Getachew Terfa (2:07:32). The Ethiopian set his personal best in winning the Xiamen title in China in 2013, won the Rome Marathon in 2:07:56 the same year and finished third in Berlin with 2:07:41 in 2009. Active in 2015 have been the Kenyan Anthony Maritim who ran his fastest time of 2:09:39 to win the Linz Marathon while Ethiopia’s Kaleb Keshebo finished second in 2:09:44 in Enschede. The “Athens Marathon. 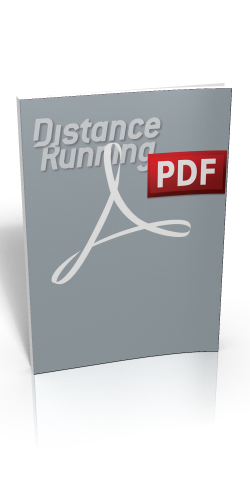 The Authentic” will present a very different face to the running world this year when the latest edition takes place on Sunday, November 8. In the light of the economic challenges facing the country and its people, the Hellenic Athletics Federation (SEGAS) has decided to forego the elite field in the marathon and concentrate on a race for mass runners, including the 5 and 10 km road races which complete the day’s programme. Parts of the money saved will be used to further improve services and entertainment for the mass runners. The 9th edition of the AIMS Marathon Symposium will also take place on the same weekend. Its main theme will be “Doping Threats in Long Distance Running”. Among the speakers there will be prominent specialists from AIMS, IAAF and WADA as well as marathon organisers and coaches. The 3rd edition of the AIMS Best Marathon Runner Awards Gala will take place in Athens as well. The two World Marathon Champions which will be determined in Beijing later this month, the holders of the fastest times of the year plus possible world record breakers in the marathon and half marathon in 2015 are expected to be among the candidates for this prestigious award. Aberu Kebede from Ethiopia will be leading the field of the top female runners at the 2015 BMW BERLIN-MARATHON. She has already won here in 2010 and 2012, achieving her standing personal best (2:20:30 h) during the legendary race in pouring rain in 2010. Her greatest competition is expected to come from Gladys Cherono of Kenya, the reigning half marathon world champion. She achieved that title in the spring of 2014 in Copenhagen. The African champion in the 5,000m and 10,000m also won silver in the 10,000m at the 2013 World Championships in Moscow. After trying out several half marathon races, crowned with the above-mentioned World Championship title, she ran her first marathon this year with quality and very promising time of 2:20:03 h – truly a world-class performance. The third in this group of top female international marathon runners who will be competing in the 2015 BMW BERLIN-MARATHON is Meseret Hailu, also of Ethiopia, whose personal best in the marathon is only insignificantly slower: In 2012 she won the Amsterdam marathon in 2:21:09 h. That same year she was also the half marathon world champion. The BMW BERLIN-MARATHON will be the tenth marathon in her career as a long-distance runner. After competing in 2012 and 2014, Anna Hahner, currently Germany’s fastest female marathon runner, will be starting at the BMW Berlin Marathon for the third time. In 2014 she ran her personal best in Berlin in 2:26:44 h, placing seventh in an international field. The greatest athletic accomplishment so far for the long-distance runner from Hünfeld near Fulda was her victory last year at the Vienna Marathon. Last Sunday she successfully tested the Olympic atmosphere at the marathon in Rio de Janeiro. Coming in behind Caroline Chemutai Komen (Kenya), Anna Hahner finished second in 2:39:15 hours on the course along the coast. Elijah Tirop Serem led a Kenyan quartet to victory and took 20 seconds off the course record to win the men’s title at the Mattoni Karlovy Vary Half Marathon in the Czech Republic on Saturday. Serem broke away from the leading group with four kilometres left to achieve what he described as the best win of his career in 61:01. Nicholas Kipkemboi finished second in 61:13 and Bernard Bett third in 61:22. The Mattoni Karlovy Vary Half Marathon is an IAAF Silver Label Road Race. The pace was strong from the start with the lead group going through 10km in 28:43 and on course to take almost a minute off the course record of 61:21, set last year by Ethiopia’s Teshome Mekonen. But the course was testing with frequent short climbs and a gentle breeze for the evening start in the historic spa town gained in strength by mid-race. By 15 km four men were in contention: Serem and the joint fastest men on the start line, Nicholas Kipkemboi and Edwin Kiptoo plus Bernard Bett. Kiptoo was the first to falter and then Elijah Serem, growing in confidence, increased the pressure. “I thought then it was up to me. We were running to break the course record and I felt strong,” reflected Elijah Serem. Nicholas Kipkemboi finished 12 seconds adrift and Bernard Bett 21 seconds behind the winner. Mulu Seboka won the women’s title, running 69:11 for a personal best and a course record by six seconds. The prolific marathoner from Ethiopia went clear at 13 km on an undulating course. Kenya’s Linah Cheruto finished second with a personal best of 70:22 while Bahrain’s Eunice Chumba placed third in 70:59. Seboka’s improvement at half marathon was long overdue, chiefly because she has concentrated on the full distance in recent years. That paid off with 2:21:56 for sixth place in Dubai in January and she admitted her marathon strength gave her confidence. The Ethiopian broke away from Linah Cheruto of Kenya and Bahrain’s Eunice Chumba at 13km, running strongly on the long road to the finish. The margin of victory was over a minute as Seboka finished in 69:11, well clear of Kenya’s Linah Cheruto who also set a personal best. Eunice Chumba finished third, almost two minutes behind the winner. Mulu Seboka will be back on the Czech roads for the Mattoni Olomouc Half Marathon on June 20 and is keen to press her claims for marathon selection for Ethiopa at the World Championships in Beijing. The half marathon debut of Ireland’s Fionnuala Britton ended in eighth place in 73:46. Britton’s talent at the distance events has been amply proven by her two European Cross Country titles but on this exploration of new territory she was never a threat to the leaders. 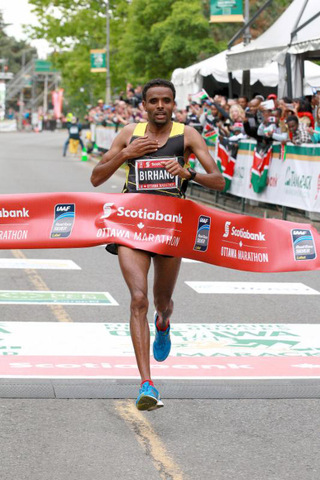 Ethiopian elite athletes once again this year took top prizes in the 41st running of the Scotiabank Ottawa Marathon this morning. They led a field of nearly 6,000 participants. Girmay Birhanu, 28, finished with a time of 2:08:14 – a solid race but not enough to topple the Ottawa 2:06:54 record set last year. 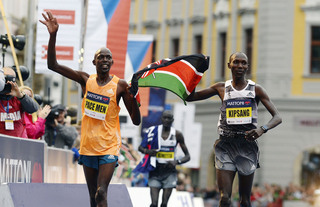 He was followed by Kenyan Philip Kangogo, 31, with a time of 2:09:56; and Ethiopian Chele Dechasa, 30, with 2:09:59. Aberu Zennebe, 31, won the women’s category in 2:25:30 with a sprint to the finish line. Zennebe was followed closely by Kenyan Rebecca Chesir, 22, at 2:25:41; and Ethiopian Abebech Aferork, 24, at 2:25:53. First Canadian woman was Rachel Hannah, who finished at 2:33:30 for a 10th place overall finish. At 28, this was the Toronto-based athlete’s first marathon. First Canadian man to finish was Vancouver-based Rob Watson, who placed 8th overall with a time of 2:19:22. Three Canadian men placed in the top ten. Watson went out aggressively, hoping for a 2:12 finish for a spot at the next Summer Olympic Games, but fell short of his goal. The Scotiabank Ottawa Marathon holds an International Association of Athletics Federation (IAAF) Silver label designation. It is the only silver label marathon event in Canada. 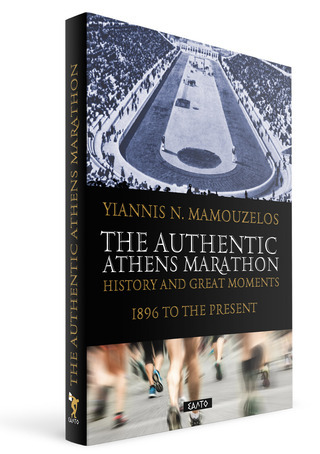 Yiannis N. Mamouzelos, The authentic Athens marathon: history and great moments 1896 to the present. Price EUR 13.50, GBP 10, USD 14. Michel Bréal, father of the modern Olympic Marathon in 1896 could never have conceived how his creation would lead to an international movement with millions of adherents all over the world. The early pioneering competitors could not have imagined that hordes of men and women, with passion and enthusiasm, would be following in their footsteps a century later. Running the original Marathon, from Marathon to the Panathenaic Stadium is many a runner’s lifelong dream: running the authentic marathon race on the road of history, legend and ideas. 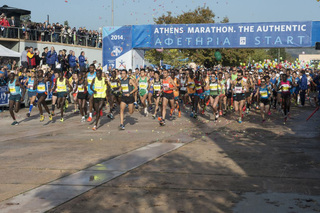 The Athens Marathon is uniquely appealing to all runners as the birthplace of the event. The authentic Athens marathon: history and great moments 1896 to the present is an aesthetically appealing publication (170 pages with extensive photographic and documentary material) written to inform foreign runners (thousands of whom run in Athens every year) by disentangling the legend, misinformation and conjecture from reality. The book presents the races, the protagonists and the performances, and the geography and history of the areas through which the route passes. In doing so it explains why this marathon has no equal on Earth. Athletes will read the historical record like a novel but without anything invented from the author’s side. They will then be in a position to appreciate how they are enacting a sequel to the events of another era: repeating the achievement of the ancient messenger in his unique effort not on the Olympic route of 1896, but in an earlier race with momentous historical significance. The Athens Marathon, which comes colourfully alive in this book, is not just a great annual sporting event, but one of great cultural, social, touristic and economic importance. The political instability that has now spread almost all over north African countries, wasn’t allowing us anymore to guarantee the safety necessary to organize the 100 km del Sahara in its original destination, Tunisia. After the last shocking terroristic attack in Tunis – we finally realized we absolutely, permanently had to change destination. Sometimes hard knocks can turn into opportunities. So, we decided to find the best possible place for re-creating the magic of Africa. A location that, as others found out before us, could offer a perfect terrain, vast and fascinating, for desert adventures: Argentina. Soon, on line, all the details of the new program. The sixth edition of the Mattoni Olomouc Half Marathon will feature the latest episode of the duelling training partners when Wilson Kipsang and Geoffrey Ronoh stand on the start line in the Czech Republic on Saturday, June 20 while the Kenyan theme of excellence will be boosted by the women’s former world record holder at the distance, Mary Keitany. The Mattoni Olomouc Half Marathon is an IAAF Gold Label road race and forms part of the seven events in the RunCzech series. A year ago Wilson Kipsang was the world record holder in the marathon and Geoffrey Ronoh a little known member of Kipsang’s illustrious training group in Kenya. That impression changed dramatically in the course of just over one hour as Ronoh beat Kipsang by eight seconds to win the Olomouc title in 60:17, his debut at the distance and only his second race at elite level outside of Kenya. The duo, who remain training partners, will renew their rivalry and both have shown the kind of form in 2015 which suggests another epic contest is in prospect. Kipsang lost his pre-eminence in the marathon when his compatriot and training partner Dennis Kimetto broke the world record in Berlin last September. However, the 2012 Olympic marathon bronze medallist remains a formidable and consistent competitor at any distance, as shown by his second place in 2:04:47 in the London Marathon in late April. He is confident that regular strength sessions in the gym and track sessions have maintained his ability to be a contender at the half marathon. Moreover, he relished his debut in the RunCzech series last year in Olomouc: “People here love the sport of running.” He has broken the hour for the distance on five occasions, the best being 58:59 to win the Ras Al Khaimah event in 2009. A back injury, now healed, hindered his preparation for the Sportisimo Prague Half Marathon in late March and he has long since been in a successful training groove and also full of respect for his rival in Olomouc, Wilson Kipsang: “He is my mentor, I learn from him. You may try to do other things but they can hurt your career. He tells me, after a workout, relax, take your time, wait for the next workout, things like that.” Geoffrey Ronoh soon built upon his success in Olomouc a year ago, bringing his best for the half marathon distance down to 59:45 with victory at Klagenfurt in Austria two weeks before making a triumphant return to Prague roads and winning the 10k race in the Birell Prague Grand Prix on September 6. Prospects are also enticing for the women’s race in Olomouc where the former half marathon world record holder Mary Keitany makes her Czech debut. She has returned strongly from maternity leave, winning the highly competitive Ras Al Khaimah event in mid-February in 66:02, the fourth fastest performance in history and only 12 seconds slower than her world record mark of 2011. She continued her form with second place in the London Marathon on April 26. This form should put the Olomouc course record of 68:53, set last year by the World marathon champion Edna Kiplagat, under pressure. Whatever the stop watch shows after the race on June 20, high quality competition should be on the menu. Abraham Cheroben defended his title with a world lead of 1:12:31. The Kenyan was almost a minute ahead of Temesgen Daba Ejerssa. The Ethiopian took second in 1:13:28 while Kenya’s Kenneth Kipkemoi was third with 1:14:18. 11,480 runners registered for the 35th edition of the BIG 25 Berlin, which back in 1981 was Germany’s first major city road race. As expected the men’s races started very fast. This is partly because the course is slightly downwards during the first five kilometres. But today the wind was also a major factor. During the first 10 k it was mostly a tailwind, which led to split times of 14:06 and 28:30 at 5 and 10 k respectively. Led by a pacemaker the four leaders – besides Cheroben, Ejerssa and Kipkemoi there was also Kenya’s Frederick Ngeny in this group – were running at world record pace. This mark of 1:11:18 was established by Kenya’s Dennis Kimetto, when he won the BIG 25 Berlin in 2012. However once the leaders passed the 11 k point, where the pacemaker dropped back, they faced a strong headwind. With forecasted wind gusts of up to 60 kilometres per hour corresponding to 7 on the Beaufort scale there was no chance of keeping this sort of pace during the remaining distance. Kilometre splits dropped by almost ten seconds from 2:51 to slightly over three minutes during some sections. Shortly before the 15 k mark, which was then passed in 43:04, Ngeny was the first one who dropped back from the leading group. The Kenyan finally finished fourth in 1:14:49. When Ejerssa worked hard in the lead he managed to drop Kipkemoi after 17 k. But the Ethiopian could not run away from Cheroben. The defending champion, who ran a world-class time of 1:11:47 a year ago, then started to attack with around six kilometres to go. On a slightly uphill stretch Cherono build a decisive lead. In the women’s race Sutume Asefa Kebede ran at her own pace right from the start, leaving the other elite women well behind. Following a pacemaker she passed the 10 k point in a breathtaking 31:05, well inside world record pace. Kenya’s Mary Keitany had run 1:19:53 in the BIG 25 in 2010. But Kebede, who now has won all of her seven road races this spring, also slowed in the wind. However she still achieved a world-class time of 1:21:55. Passing the half marathon point before, which has an official timing, she was clocked with 68:23. This is by far the fastest half marathon time of a woman on German territory since spring 2013. Behind Kenyans Jepkorir (1:25:59) and Cherono (1:26:59) two Ethiopians followed in fourth and fifth: Helen Bekele Tola and Zewdnesh Ayele Belachew clocked sub 1:30 times with 1:27:39 and 1:28:55 respectively. Felix Kandie might well not have made it to the start line of the Volkswagen Prague Marathon on Sunday morning, feeling the effects of a sore throat. But he decided to give it a go and his resolution paid off handsomely. “I wanted to see how far I could get,” said Kandie. In the end, he went to the limit in the Czech capital. Coming from behind he took his second marathon win in a succession with another personal best. The 27 year-old improved to 2:08:32 in the Volkswagen Prague Marathon. Last November Kandie showed his strength to set a 2:10:37 course record in the Athens Marathon. Fellow-Kenyan Evans Chebet was runner-up for the second consecutive year with 2:08:50, followed by Ethiopia’s Deribe Robi, who finished in 2:09:05. 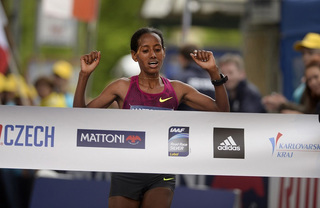 Yebrgual Melese of Ethiopia clocked a fine 2:23:49 to take the women’s race in Prague. It is the third fastest winning time in the history of the race that was first started in 1995. Portugal’s Sara Moreira took second in her second marathon race with a personal best of 2:24:49, improving on her debut in New York last November by over a minute. Letebrhan Haylay of Ethiopia was third with 2:25:24. 10,000 runners entered the Volkswagen Prague Marathon, which is an IAAF Gold Label Road Race. It might have helped Felix Kandie that the pace in the men’s race was much slower than planned despite very good weather conditions. Kenyan pacemaker Benjamin Ngandu was supposed to pass through half way in just unter 63 minutes and he tried his best. However the group of favourites did not follow him. Ngandu was running 30 to 40 metres ahead of the first group. It was Hillary Kipchumba who then was on the heels of Ngandu and the pair reached half way in 64:00. While Ngandu dropped out after 27 k Evans Chebet moved up to Kipchumba. When they reached 30 k in 1:30:29 they were 22 seconds ahead of a chasing group of four with Kenyans Felix Kandie and Geoffrey Ronoh as well as Ethiopians Fikre Assefa and Deribe Robi. When last year’s runner-up Chebet surged ahead with ten kilometres to go this looked like the decisive moment in the battle for victory. But then it was Kandie time in Prague. Breaking up the chasing group with a surge the Kenyan covered the 5 k section from 30 to 35 in 14:54. That propelled him within two seconds of the leader Chebet at 35 k. And it was soon after that he overtook the fellow Kenyan and built a big lead. “I felt tired at around 39 k so I just made sure that I would win,” said Kandie, the man who had broken the course record of Italy’s 2004 Olympic Champion Stefano Baldini in Athens last year. With a time of 2:08:32 Kandie was 18 seconds ahead of Evans Chebet, who was not disappointed on missing out on victory for a second time in a row. “I had a leg problem in the build up to the race. So this time I am really happy with the second place. Hopefully I can finally achieve victory next year,” said Chebet. Behind Ethiopians Deribe Robi and Fikre Assefa, who ran 2:09:05 and 2:10:01 respectively, Geoffrey Ronoh finished fifth with 2:10:52. The Kenyan improved by almost five minutes. He had hoped for a much faster time though and was on course for that when he ran in third place after 35 k. But during the final section Ronoh tired and lost a lot of ground. In contrast to the men’s event the women’s race was much faster during the first half. It was Kenya’s Janet Rono who stormed away with her pacemaker soon after the start. Passing 10 k in 33:45 she was on course for a sub 2:23 time. Sara Moreira followed in second with 34:08 and another 16 seconds back there was the big group with all the Ethiopian contenders. There was no change of this order at half way (71:43), but Rono began to slow and the Ethiopians were starting to close the gaps. When Moreira was caught she managed to hang on, but once the group reached Rono the Kenyan was quickly dropped. They then passed 30 k in 1:42:53 and Moreira was the only non-Ethiopian left in the leading group, running besides Yebrgual Melese, Tadelech Bekele, Haylay Letebrhan and Ashete Bekere. Bekele and Bekere could not hold on much longer. And when 25 year-old Melese, who won this year’s Houston Marathon in January with a personal best of 2:23:23, surged the small group broke up. Melese looked very strong in the final five kilometres and finished in 2:23:49, exactly one minute ahead of Moreira. Haylay followed in third with 2:25:24 while Rono managed to secure fourth place in 2:26:31. With six runners finishing inside 2:28 the race had a very good depth. Only Dubai, London and Paris had more runners inside this time this year. “It was my plan to save some energy for the second half. This is why I chose a more careful approach and did not start that fast,” said Yebrgual Melese. Second placed Sara Moreira was more than happy with her performance. “I had a leg injury so I could not run London. I was looking for another opportunity and was happy to get the chance to run Prague,” said Sara Moreira, who ran her marathon debut in New York last November, finishing third in 2:26:00. 29 year-old Moreira looks capable of finally breaking Rosa Mota’s 30 year-old Portugese record of 2:23:29, set in finishing third in Chicago. Another major Berlin road race renowned for its super fast times will be started this Sunday: The BIG 25 Berlin is the event which helds the two current 25 k world records. Dennis Kimetto ran 1:11:18 in 2012 while fellow-Kenyan Mary Keitany clocked 1:19:53 five years ago. While it is unlikely that these records will be under threat on Sunday the men’s race might well be very fast again. Defending champion Abraham Cheroben will return to the BIG 25 Berlin as will last year’s runner-up, fellow-Kenyan Kenneth Kipkemoi. Ethiopia’s Sutume Asefa Kebede and Elizeba Cherono from Kenya are the favourites in the women’s race. The BIG 25 Berlin will see its 35th edition on Sunday. Back in spring 1981 the event was Germany’s first major city road race and a trendsetter for German road running. Marathon races in Frankfurt and Berlin followed the example of the 25 k and were staged in the city for the first time later in 1981. Organisers of the BIG 25 Berlin have registered more than 11,000 runners for Sunday’s races, which will include a half marathon, a 10 k race and a 5×5 relay event. All races feature the spectacular finish inside the Berlin Olympic Stadium. A year ago Abraham Cherono clocked a world lead of 1:11:47 to take the BIG 25 Berlin. His result still is the fourth fastest time ever run at this distance. When the 22 year-old Kenyan returns to Berlin he aims to improve his personal best. The current world leading time of 1:13:48 could be improved by quite a margin if weather conditions are favourable. Cheroben was last year’s number one in the world at the half marathon distance as well. He won the Valencia race with 58:48 in October. It will already be his second start in Berlin this spring. Six weeks ago Cheroben was third in the Berlin half marathon. Despite a muscle problem that occurred during the race he clocked a fine time of 59:49. However there is some tough competition waiting for Cheroben on Sunday. Another duel with Kenneth Kipkemoi is likely. 30 year-old Kipkemoi has twice been second behind Cheroben last year. In the BIG 25 Berlin he clocked a fine 1:12:32 and then Kipkemoi improved to a world-class 59:01 in the Valencia half marathon, again being beaten by Cherono. Kipkemoi remained number two in the world rankings for the half marathon last year with his time from Valencia. Kenyans Charles Maina and Frederick Ngeny could also do well on Sunday. They have sub 62 minutes’ half marathon PBs of 61:13 and 61:37 respectively. It would be a major surprise if Kenya’s win streak would come to an end in Berlin. Since 2001 the winner of the BIG 25 has alsways been a Kenyan. It is exactly the same in the women’s race. 14 times in a row a Kenyan woman took the BIG 25. However that series is under severe threat on Sunday. 21 year-old Ethiopian newcomer Sutume Asefa Kebede looks capable of putting an end to the Kenyan success story. And she will be eager to add to her own win streak: This year she has won all of her five races in Europe. Among them were wins at 10 k and in the half marathon: She clocked 31:49 in Paderborn (Germany) and then 69:07 in Verbania (Italy) in April. Sutume Asefa Kebede’s strongest rival is likely to be Elizeba Cherono. The Kenyan was second in the Berlin Half Marathon in March. She clocked 70:56 in that race while her PB stands at 70:15. However there is another Ethiopian who could do well in the BIG 25 Berlin: Zewdnesh Ayele Belachew has a half marathon PB of 71:37. At a ceremony held in Ras Al Khaimah (UAE) on 12 February Dennis Kimetto was presented with the AIMS World Record Award in recognition of his World Record breaking time of 2:02:57 set in the BMW Berlin Marathon on 28 September 2014. His achievement was given global recognition with this award subsequent to the record’s ratification and on the eve of the RAK Half Marathon, where he was guest of honour. The presentation was jointly made by AIMS General Secretary Hugh Jones and Race Director of the RAK Half Marathon and AIMS Continental PR Manager for Asia Nathan Clayton. Kimetto (31) broke the previous record by 26 seconds, which had been set by his compatriot Wilson Kipsang in the same event in 2013. 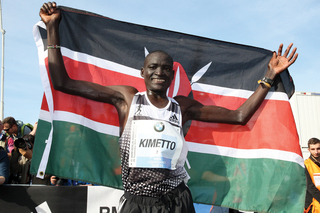 Dennis Kimetto’s outstanding performances throughout 2014 were previously recognised with the AIMS Best Marathon Runner Award presented in November 2014 at the AIMS Gala held in Athens, the birthplace of the marathon. Calgary Marathon is acclaiming three local running heroes who didn’t stand in their rightful podium place last summer. A ruling by the International Association of Athletics Federations (IAAF), disqualified the results of the top finisher, Emily Chepkorir. Chepkorir previously tested positive for Nandrolone (an anabolic steroid) at races in Guatemala on 26 January and Mexico on 02 March; all subsequent results are disqualified and she is ineligible to compete until 5 April 2016. The top three women have been alerted and have been properly compensated for their outstanding race day efforts with the rightful prize money. Maria Zambrano, of Calgary, is awarded 1st place, Nadine Mueller second and Andrea Glover third. Calgary Marathon has adjusted the 2014 results and applauds the IAAF for its diligence in its efforts to identify, investigate and disqualify athletes who are using banned substances. “We can adjust results and prize money but we can never give the rightful winners their moments of glory” said Calgary Marathon Society Chair, Dan Ouimet.